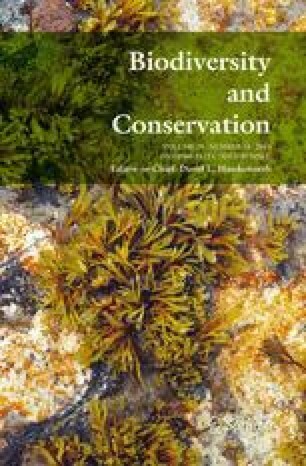 South-eastern Spain is a key area for assessing the effects of climatic change on Mediterranean biodiversity since it represents an ecotone between the Mediterranean macrobioclimate and a vegetation with subtropical components. It also maintains many restricted-distribution species such as forests of Tetraclinis articulata, which with the exception of Malta, only is found here in Europe. The likely response of the species under B2 and A2 climatic scenarios is studied, using the species distribution model (SDM) and a high-resolution regional climate model (RCM). The results point to a marked increase in potential habitat under the B2 scenario, including a shift toward higher altitude and latitude values. Under the A2 scenario a substantial reduction in potential habitat is to be expected, accompanied by a drastic change in its geographical distribution, with the emergence of a new suitable area in the mountains of the interior and the total loss of the species’ present coastal habitat. Under the B2 scenario the network of reserves seems to be adequate since this would provide a substantial increase in the protected habitat, the present and future potential habitats partially overlap and most of the reserves are sufficiently close to allow the migration of the species by means of short-distance dispersal mechanisms. Under the A2 scenario, two existing reserves in the interior would be suitable, although the probability of natural migration is low due to the low dispersal capability of the species and the absence of overlapping areas between the present and future potential distribution areas.